Daucus carota. 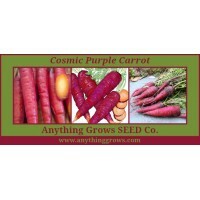 Carrots are originally from central Asia and they come in so many colors besides orange—purple and red types are actually the original ones! 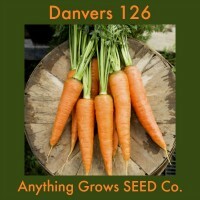 The tiny seed must be sown very shallow; to avoid drying out, especially when sown in hot weather, shade the seed bed or row with boards, paper, or something to exclude the hot sun and hold in moisture. Long-rooted types need a deep, mellow soil; in heavier soils, grow half-long or round types. 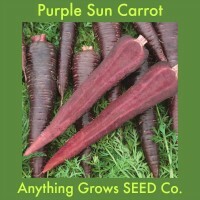 Most of our varieties of heirloom carrots mature around 65-70 days from sowing. Early sowings can be made 2-3 weeks before spring’s last frost date. 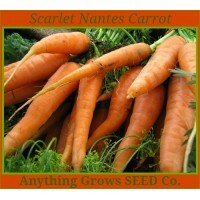 The tiny carrot seeds should be surface-sown and not covered, or covered only minimally, and kept uniformly moist until seedlings are strong. May be sown throughout spring and summer at 2-3 week intervals, until about a month before first frost in autumn. Deep, mellow, well-worked soil suits long types; half-longs and round types are better bets in heavier soils. 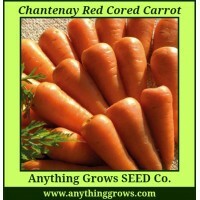 Do try growing carrots—they are easy and rewarding!